Could The Rolling Stones' New Album Boost Chicago Blues? B.L.U.E.S. 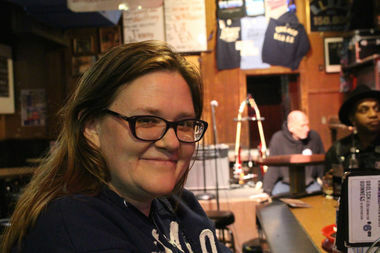 general manager Jen Littleton says Chicago blues "can always use a shot in the arm. It's a tough business." LINCOLN PARK — The city's blues clubs are expecting a boost from an old, reliable, but long-dormant source — the Rolling Stones. The Stones release their first studio album in over a decade on Friday: "Blue and Lonesome," a return to the band's roots covering the Chicago blues songs they've always loved. "It's great that the Stones are coming out with a blues album," said Jen Littleton, general manager of B.L.U.E.S., 2519 N. Halsted St. "I can't wait to hear it, actually." The Stones' love for Chicago blues goes back to the beginnings of the band, and Mick Jagger and Keith Richards have talked about bonding over Muddy Waters, who recorded at Chess Records in the South Loop. The Stones recorded there in 1964 and 1965, including their first song to top the charts, "It's All Over Now." They also did an instrumental piece named after the address of Chess, 2120 S. Michigan Ave.
And if it seems as if Chicago's electric blues scene can always use a little extra attention, there's no time like the present. "It's not a big community at all," Littleton said. "It's a big city, but it's a very small community. "Anything that brings more awareness to blues definitely helps us," she added. "It can always use a shot in the arm. It's a tough business." "The blues gets very short shrift here," said Doc Pellegrino, owner of Kingston Mines, 2548 N. Halsted, Lincoln Park's other surviving and thriving Lincoln Park blues club. The Stones played at the club in the '80s. "I'm the only one who gets sort of good treatment, because I'm so big," he added. "But several of the places have been going out of business the last few years. "I think it'll be good for blues. It'll help us some," Pellegrino said. "I hope it helps the other blues clubs more than us. We don't need that much help. I'm not turning it down, but we are very popular." With its double-stage, music-never-stops approach, Kingston Mines remains one of the city's most popular blues clubs. And his daughter, Donna Pellegrino, credits the free weeknight admission for students and teachers adopted almost 20 years ago with growing the music long-term. "That gave us such a boost," she said. "It took a little while to catch on, because young people weren't listening to blues. "Gradually, they started coming in more and more," she added. "When you get young people listening to it, dancing and having a great time, they keep coming back." It's worth noting that a sign in front of the stage just inside the front door at Kingston Mines reads, "Dancing Aloud." Donna Pellegrino said "The Blues Brothers" movie similarly put the music in vogue in the early '80s. "It really, really gave a boost to the blues for a long time," she said. Now the Stones figure to do the same. "Blue and Lonesome" was recorded in three days almost a year ago. With the Stones suffering something of a case of writer's block on new material — they haven't released a new studio album since "A Bigger Bang" in 2005 — they found themselves settling into the old reliable groove of their earliest albums by covering old-school Chicago blues numbers. And there's not a "Sweet Home Chicago" in the bunch, instead relying on connoisseur's picks like Jimmy Reed's "Little Rain" and Howlin' Wolf's "Commit a Crime." The first video off the album, "Hate to See You Go," gives an idea of the raw approach. The video appears to feature mainly scenes from New York, although there is a few snippets from Chicago, including a view of the Chicago "L" stop on the Brown Line. The Stones being the Stones, of course, there's always a chance they'll pop into a local blues club to promote the new album at some point. "That'd be nice," Donna Pellegrino said. Littleton, however, said the Stones were more likely to turn up at Buddy Guy's Legends during his annual January residency at his South Loop club than they were to pop in at B.L.U.E.S. "We might let that rumor go around," Littleton said, "but no, I doubt that."